Early in the life of the Obama administration we were treated to one of those cheesy "made-for-TV" moments that was just about too corny even for our exalted medium. 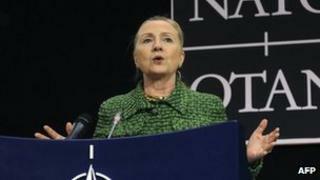 US Secretary of State Hillary Rodham Clinton travelled to Geneva to meet the Russian foreign minister and pressed the reset button. A real-life big red button, symbolising a new start, a better relationship. As it happens, her translation was a bit awry and the Russian word on the button could mean "overcharged". Now, "highly charged" might be the more appropriate phrase. The relationship seems to have been rebooted again and it has gone back to a much older, even Cold War, format. The Russian leader says protesters have been stirred up by the Americans. The Americans say Russia is ignoring democratic norms. Make no mistake. This is no accident. Hillary Clinton has not been caught out by a stray question in an unguarded moment. She has repeatedly gone out of her way to call the Russian elections "unfair" and "rigged". There is something of a stark contrast with Obama's reaction to other democracy movements. He was painfully slow to support protesters facing far worse abuses in Iran. Some saw him as slow to support the anti-Mubarak protest in Egypt. He certainly did not rush to speak out about the crushing of protest in Bahrain. The reaction to Russia is all the more puzzling as many around Washington will tell you the only really close relationship Obama has with a foreign leader is with President Dmitry Medvedev. I turned to Matt Rojansky from the Carnegie Endowment for his assessment of what has happened. He thinks the relationship has gone downhill as both the US and Russia enter a tricky electoral cycle. Goodwill has been exhausted. The reset produced results, but what he calls "the low hanging fruit" have already been plucked. There was the START treaty, an important agreement on narcotics and terrorism and an agreement to allow military traffic through, avoiding Pakistan. But the deputy director of the Russia and Eurasia programme at the Carnegie Endowment says they are now stuck on America's insistence on a missile defence system. The US says it is about protection against Iran, but Russia fears it is aimed at undermining their defence. He calls it "a load-bearing wall" which could crush everything else beneath it unless it is propped up. Russia is going back to the old days, producing weapons it does not really need and putting weapons amidst European Union countries in the strange Russian exclave of Kaliningrad. Mr Rojansky told me that he thought as failure became more likely both sides were keen to portray the other as awkward customers, as an explanation for why no agreement has been forthcoming. But he also thinks US policy-makers see fewer risks in criticising Russia than foes like Iran, or friends like Bahrain. And in the perceived absence of terrible consequences they default to the position of supporting democratic protesters. It will take serious negotiations, after the big elections of 2012, to sort this difficult relationship out and I guarantee those talks will be free of cheesy visual aids.